You can Special Summon this card (from your hand) by banishing 1 LIGHT and 1 DARK monster from your Graveyard. You can Special Summon this card (from your Graveyard) by sending 1 LIGHT and 1 DARK monster from your hand to the Graveyard. When this card is sent from the field to the Graveyard: You can target 1 Level 5 or higher DARK Dragon-Type monster in your Graveyard; Special Summon that target. This card is the LIGHT counterpart of Darkflare Dragon. Both have Chaos-style Summoning requirements. This card's effect can Special Summon Darkflare Dragon. Both monsters are named after space phenomena: a pulsar for this monster and a solar flare for Darkflare Dragon. Both monsters appear in the artwork of Dragon's Rebirth. Both of them have younger counterparts. White Dragon Wyverburster for this one and Black Dragon Collapserpent for Darkflare Dragon. This card, along with Darkflare Dragon, are the first two cards to share the role of being Cover Cards for the same Structure Deck. When this card's text was first shown in a Japanese magazine scan, its last sentence used the word If this card is sent rather than When" as with the actual released card. The change was likely made to prevent a potentially disastrous FTK loop that involved combining this card with Red-Eyes Darkness Metal Dragon to continuously use the effect of Cannon Soldier (or Toon Cannon Soldier), Tributing each Dragon over and over for damage while their effects continually revived each other. The new text now causes this card's effect to miss the timing if the loop is attempted. This makes this card one of the few cards to have received a public errata change before even being released, and almost certainly the one to have had the greatest impact. This card's summoning methods are similar to Dark Simorgh, in that they allow monsters of two different Attributes to be removed from the hand or Graveyard in order to Special Summon themselves from the other location. The only difference is that Dark Simorgh" requires the monsters to be banished in both cases, while to Summon this card from the Graveyard, the monsters only need to be sent to the Graveyard. Sending 1 LIGHT Monster and 1 DARK Monster in the hand to the Graveyard is a Summoning Condition to Special Summon this monster from the Graveyard. Also, this Special Summon does not start a chain. The effect that Special Summons a level 5 or higher DARK Dragon-Type monster targets. If this card is tributed for a Tribute Summon, sent to the Graveyard as a cost, or sent to the Graveyard while an effect is still resolving, the timing is missed and the effect cannot be activated. If this card is sent to the Graveyard during the Damage Step, its effect to Special Summon a Dragon-Type monster can still be activated. While "Macro Cosmos" is active, cards sent to the Graveyard are banished instead, so cards cannot be sent from the hand to the Graveyard. Therefore, a LIGHT and DARK monster cannot be sent from the hand to the Graveyard to Special Summon "Lightpulsar Dragon" from the Graveyard. Also, even if "Macro Cosmos" is active, a LIGHT and DARK monster can be banished from the Graveyard to Special Summon "Lightpulsar Dragon" from the hand. : While "Macro Cosmos" is active, can a LIGHT and DARK monster be sent from the hand to the Graveyard to Special Summon "Lightpulsar Dragon" from the Graveyard? 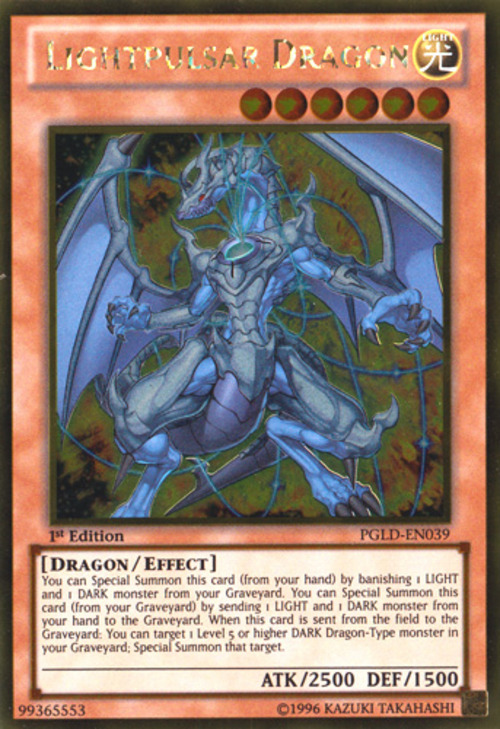 Also, while "Macro Cosmos" is active, can a LIGHT and DARK monster be banished from the Graveyard to Special Summon "Lightpulsar Dragon" from the hand? If at the time of the resolution of "Lightpulsar Dragon" the effect of "Zombie World" is applying, so that the Type of the monsters in the Graveyard has changed from Dragon to Zombie, the monster targeted by the effect of "Lightpulsar Dragon" cannot be Special Summoned. : A face-up "Zombie World" is having its effects negated by "Spell Canceller". At that time, "Lightpulsar Dragon" was sent from the field to the Graveyard, and activated its effect to Special Summon a Level 5 or higher DARK Dragon-Type monster, and "Raigeki Break" was chained targeting "Spell Canceller". In this scenario, while the effect of "Zombie World" will be applied once again, treating all monsters in the Graveyard as Zombie-Type monsters, can the effect of "Lightpulsar Dragon" still Special Summon the targeted monster? "Lightpulsar Dragon" effect that Special Summons a level 5 or higher DARK Dragon-Type monster is an effect that activates in the Graveyard. Therefore, if you take control of the opponent's "Lightpulsar Dragon" and it is sent to the opponent's Graveyard, the opponent, being the owner, can activate its effect. : If you take control of a "Lightpulsar Dragon" that the opponent owns and it is sent to the opponent's Graveyard, which player gets to activate its effect? Even if a face-down "Lightpulsar Dragon" is sent from the field to the Graveyard while it's still face-down, the effect can be activated. : If a face-down "Lightpulsar Dragon" is sent from the field to the Graveyard while it's still face-down, can its effect to Special Summon a Level 5 or higher DARK Dragon-Type monster be activated? If "Lightpulsar Dragon" and "Red-Eyes Darkness Metal Dragon" are destroyed on the field simultaneously by the effect of "Dark Hole", that "Red-Eyes Darkness Metal Dragon" can be Special Summoned from the Graveyard by the effect of "Lightpulsar Dragon". : If "Lightpulsar Dragon" and "Red-Eyes Darkness Metal Dragon" are destroyed on the field simultaneously by the effect of "Dark Hole", can the effect of "Lightpulsar Dragon" Special Summon that "Red-Eyes Darkness Metal Dragon" from the Graveyard?